In the aftermath of World War III, a company of soldiers barricade themselves underground with a sleep-inducing drug and a copy of A Midsummer Night's Dream. 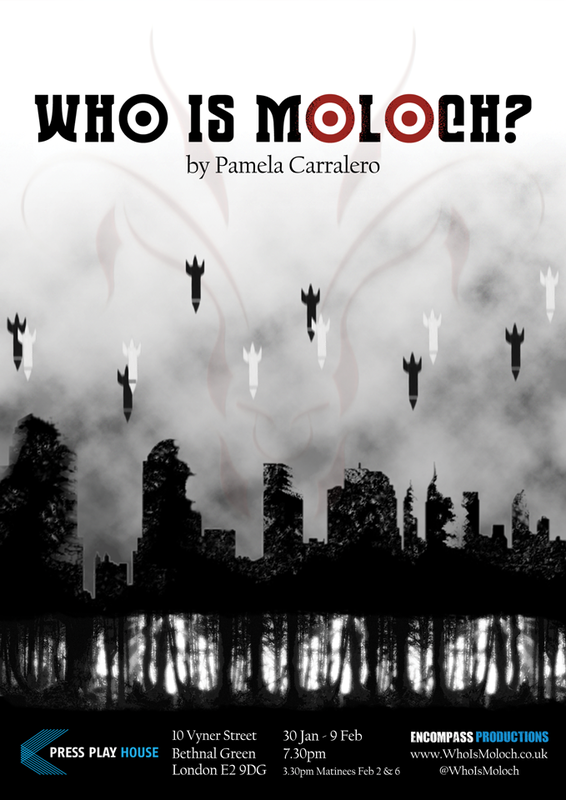 As the play sinks into each soldier’s subconscious, their battle to come to terms with their experiences leads them to question: who is Moloch and what survives? "Who Is Moloch? promises to be one of the most intriguing and impactful productions of 2013"
There's still time to sponsor the show and get exclusive rewards and free tickets! Click here! COME TO THE WHO IS MOLOCH? LAUNCH PARTY! To celebrate the launch of our upcoming World War III stage epic ‘Who Is Moloch?’ Encompass have put together the absolute BEST line-up of LIVE MUSIC there is to see in London on a Friday night! And best of all, it’s COMPLETELY FREE! It’s World War III themed and we’ll have PRIZES for the BEST DRESSED – including tickets to see our show! Feeling a bit wounded from a busy week? Have a drink from the MADD BAR and get a MASSAGE from our qualified professional masseuse! This is the last event in ‘The Month of Moloch’ so come on down to Press Play House on Fri 25 and declare your loyalty to the mission! THE MONTH OF MOLOCH - ROUNDUP! 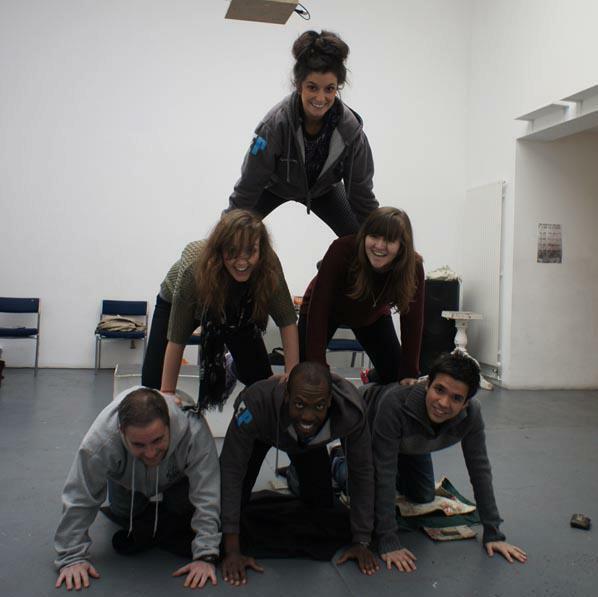 Just one of the challenges we were set by sponsors! From the 3rd - 4th Jan we had our 24hr Sponsored StayAwake, where the cast and crew of Who Is Moloch? were tasked with staying awake for 24hrs and undergoing a series of challenges, ranging from human pyramids, acting out scenes from movies to renditions of Bohemian Rhapsody and a chilli eating contest! We racked up 511 views on our two webcam streams and a lot of you joined us via Facebook and Twitter. The StayAwake fundraised a record amount for Encompass, thank you for your support! On the 10th Jan Metro and Londonist recommended Shoot From The Hip! 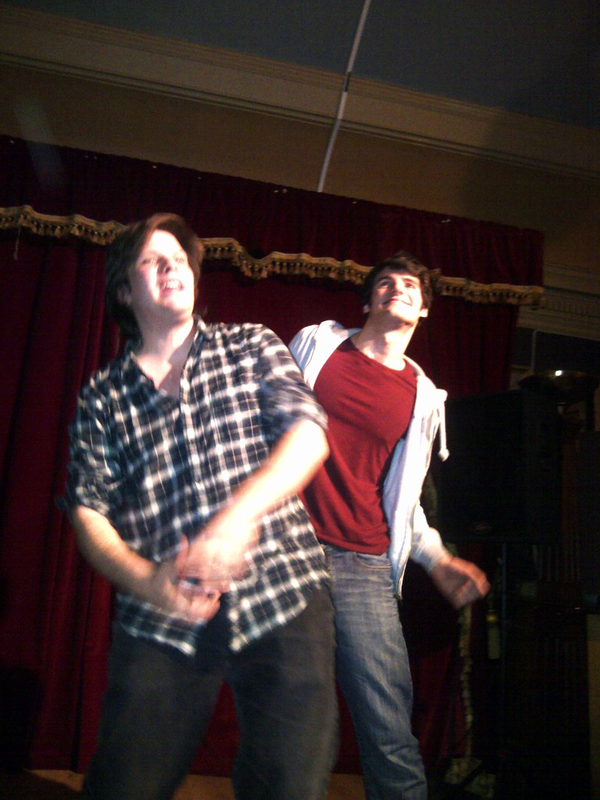 hosted a night of improvised comedy in aid of Who Is Moloch? at The Horse, and what a night it was! Our side-splittingly funny chums have a FREE weekly show in London's West-End at the Top Secret Comedy Club - go check them out! 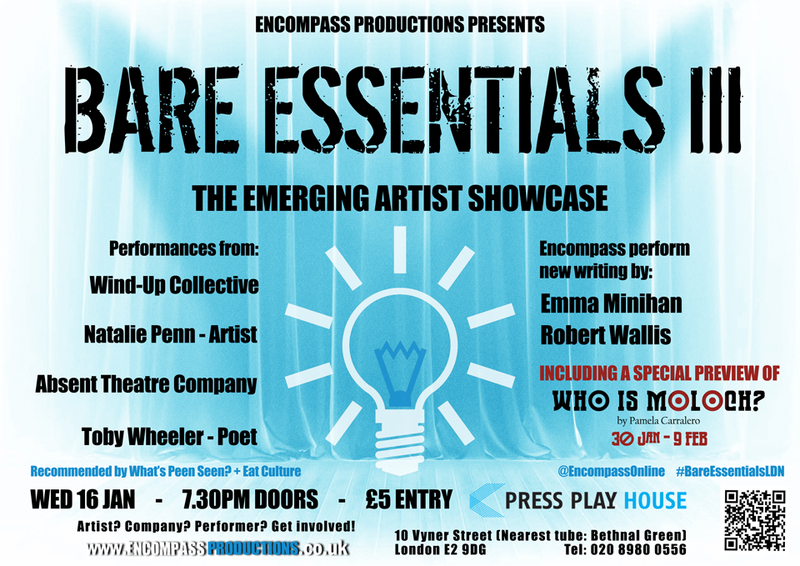 On the 16th Jan we hosted Bare Essentials III: The Emerging Artist Showcase at Press Play House. Our third Bare Essentials event brought together an eclectic mix of talent including guest artists including the Wind-up Collective, Natalie Penn and performance poet Toby Wheeler. 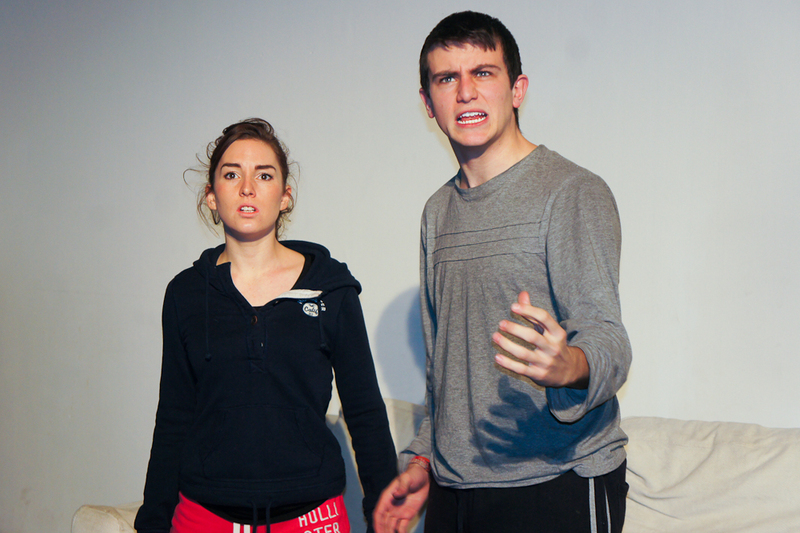 Encompass performed the work of playwrights Robert Wallis and Emma Minihan, previewed Who Is Moloch? 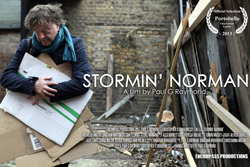 and had a surprise screening of our short film Stormin' Norman, which What's Peen Seen? said was "heartfelt; hence the plight of London’s homeless resonated on the tube home afterwards". You can read the rest of their Bare Essentials III review here. What's Peen Seen? are also running a competition to win two tickets to see Who Is Moloch? - find out more here! We hope to see you all at 'The Declaration' Who Is Moloch? 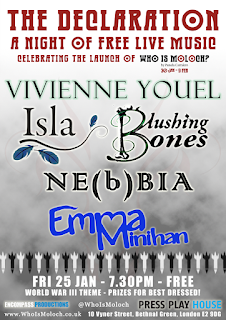 launch party this Friday as our 'Month of Moloch' events finally draw to a close. But don't forget...Who Is Moloch? arrives next week! Grab your tickets while you still can! Labels: Bare Essentials III, Bare Essentials: The Emerging Artist Showcase, Launch Party, Shoot from the Hip, The Declaration, The Month of Moloch, The StayAwake, tickets, Who is Moloch? The Month of Moloch is here! 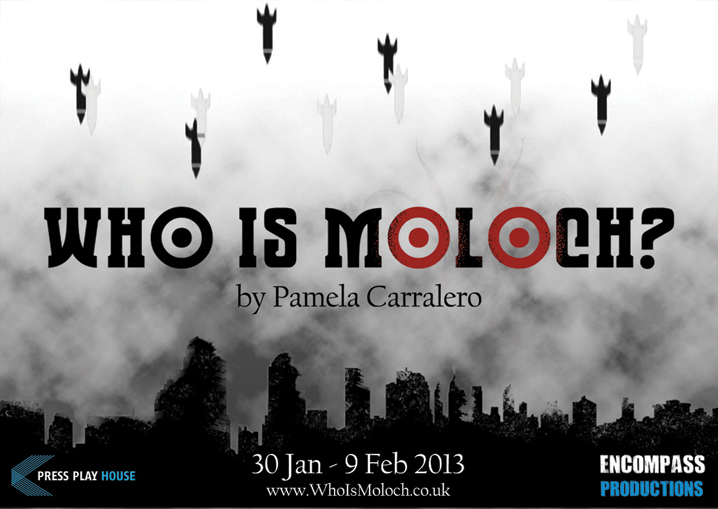 We've got four fantastic events in the lead up to the world premiere of Who Is Moloch? 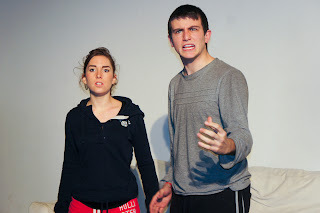 by Pamela Carralero, starting with today's 24 hour StayAwake at Press Play House! 24 Hours. No Sleep. We're taking on a bunch of crazy challenges of endurance throughout the period. What do you want to see us do? SEND YOUR CHALLENGES to events@encompassproductions.co.uk or tweet us @WhoIsMoloch #StayAwakeLive - and of course you can now buy tickets for Who Is Moloch? by clicking here! WATCH THE LIVE WEBCAM STREAMS BELOW! 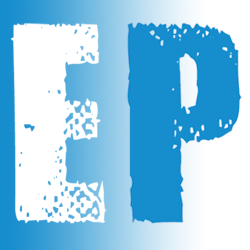 Encompass Productions is a non-funded collective of artists, and like many arts organisations we currently run as a non-profit. Whilst at many times this can prove challenging, the good news is that we get to put on a wide variety of exciting live events to help fund our work! Why not sponsor us a few pennies and help us realise the ambitions of our incredibly exciting show? Click here! 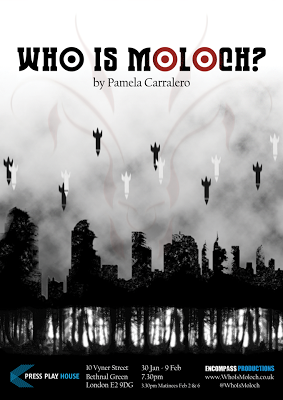 Tickets are now on sale for Who Is Moloch? by Pamela Carralero! World War III. Trapped underground with a sleep-inducing drug and a copy of A Midsummer Night’s Dream, a company of soldiers fight to survive the terrifying reality of war as their grip on reality is put to the test. Who is Moloch and what surives? You can purchase tickets from the Who Is Moloch? website or directly via Press Play House. 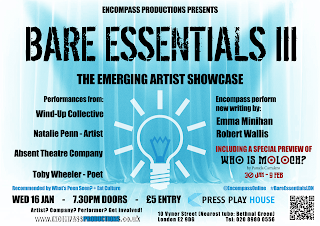 For our third showcase the line-up of talent is our most exciting yet and we at Encompass Productions will be previewing a scene from Who Is Moloch?, as well as performing a selection of pieces submitted by up-and-coming writers! 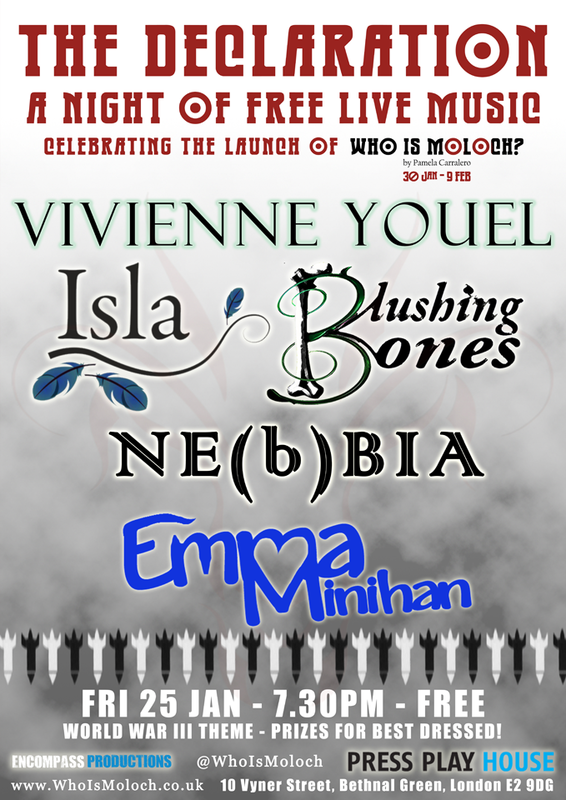 So if you're looking for a cracking night or are an artist yourself, come along to Press Play House and support emerging talent! Unusual occurrences can sometimes come in threes, so we'll keep an eye out if we receive anything more! Whatever it is, there are definite connections to 'The Daily Reverie' newspaper we received in late November last year. Don't forget the Sponsored 24 hour StayAwake is this Thursday at Press Play House and also streaming online from the Who Is Moloch? website. The team are looking for challenges to do in that time, so why not email us or tweet @WhoIsMoloch #StayAwakeLive - they'll need all the help they can get!